There are currently 3,660 users on this website. It was not only the French I.T.P. printers that used their famous "camaieu" method of printing stamps (see http://blog-impressions-timbrees.bl...-pour-3.html ) for such countries as Laos or Monaco, once (and, as for their earlier issues, still) so popular with stamp collectors, but the B.E.P. also experimented with much the same system for the 5-cent stamp commemorating the 100th anniversary of Nevada statehood issued in 1964 (see http://arago.si.edu/index.asp?con=1...144982&img=1 ). This issue was printed on the Giori press using three inks (yellow, red and blue) applied in various combinations to the same area to create new hues (e.g. yellow and blue giving green) but the experiment seems to have been discontinued in favour of other methods. Technically, Scott USA #1246 could be compared with such products of the French Imprimerie du Timbre-Poste, boulevard Brune, Paris, as the Monaco 1962 Multiple Sclerosis stamp, Scott Monaco #506 (S.G. #724), also printed by a similar method using yellow, red and blue inks. Would it be possible for someone to refer me to an Internet source describing this method of printing the above stamp so that I could get acquainted with the proper technical terms used in English, please? Or just suggest a source of information available elsewhere? quigngt - Thanks a lot for the link, which I find most useful and am now studying. Only am I not sure whether it refers to what the French printers call "camaieu", that is two different inks applied to the same zone so as to mix in the intaglio cuts and create a new hew, e.g. red and blue yielding purple. Glad to be of help. I have no knowledge about the French term "camaieu", so I can't help you with that. http://arago.si.edu/index.asp?con=1 making use of their enlarged images. For instance, while http://www.1847usa.com/ByYear/1966.htm includes the "The Boating Party" by Mary Cassatt stamp among those printed on the Giori press, not among those printed by Offset Lithoghraphy and by Intaglio, and Arago: Philately adds "Six inks were applied in two passes through the Giori press, and these were blended and overlaid to create many additional tones", again not mentioning Offset Lithography in http://arago.si.edu/index.asp?con=1...&tid=2034204 , I believe this was a combination printing by offset and intaglio, an offset plate had applied yellow, moss green and red, the stamp then moved to the Giori press where crimson, blue and green were printed, judging from the enlarged image on http://arago.si.edu/index.asp?con=1...144712&img=1 . This combination printing method was used for many issues that followed, such as the Christmas 1966 Madonna and Child by Hans Memling stamp, where http://arago.si.edu/index.asp?con=1...&tid=2034203 states "The Madonna's gown and portions of the tapestry were printed blue by lithography. A second offset plate applied orange to the tapestry, blending with the blue to produce green. Some portions of the tapestry remained orange. The stamp then moved to the Giori press where deep brown, light brown, and red were printed." Compare the 1968 Chief Joseph stamp, where http://arago.si.edu/index.asp?con=1...&tid=2034267 says: "This five-color stamp required three passes through the presses: two by offset and one by Giori. For the flesh tones, red and yellow were laid on by offset, followed by brown by intaglio. The warrior's hair was printed black by intaglio, with blue tones by offset." In my previous post I said I believed the "The Boating Party" by Mary Cassatt stamp to be a combination printing by offset and intaglio judging from the enlarged image on http://arago.si.edu/index.asp?con=1...144712&img=1 , in contrast to what I had found on http://www.1847usa.com/ByYear/1966.htm and Arago: Philately, both of these sources agreeing on passes through the Giori press only. Now that I have managed to view, on http://arago.si.edu/index.asp?con=2...=1&id=144712 , the enlarged images of plate proofs 28793 (in blue) and 28776 (in brown) with notes on their bottom margins reading "B2220 Giori" (on the former) and "(2 pl. Gi.) BN 565 Giori" (on the latter), I know I was utterly wrong while both the above sources were right. What I can see in plate proof 28776 (in brown), however, reminds me of offset-recess or impression taille-douce report shown by Galeoptix in his post of 05/13/2013 3:20 pm on http://goscf.com/t/9106&whichpage=116 . Could someone explain? Thank you. With reference to what has recently been posted in the Retired Stamp Printer�s Blog on French Stamps/Their Printing thread I am returning to the subject of the possible "camaieu" printings of certain US stamps seeking kind assistance from persons knowledgeable about US stamp printing methods in the hope that the more you learn about the stamps you like, the better you like them as is often the case. The "Camaieu" (a term coined in France for these stamps) is a stamp printed on 3-colour Giori-type presses (e.g. the Chambon ones used in France as Papy24 tells us elsewhere in this forum) requiring double inking (by two different inking rollers) of certain areas of the engraving, the process carried out on one and the same printing plate in order to create a new colour through mixing the two inks in the cuts in the said area of the printing plate. Each of these designs was engraved into a single die and each of the respective stamps was printed from one and the same printing plate with (presumably) three inks (this is expressly stated for the 1962 Arizona Statehood issue and the 1964 Nevada Statehood one) selectively applied to the cuts in the printing plate, some of the inks applied to the same areas so as to mix and create further colours in certain areas of the engraving. The question is: Can someone confirm or refute this conjecture? Thank you. As you know, the press inking system "Giori" is different from the system "Chambon" is direct, then it seems to me than "Giori" is indirect with intermediate inking cylinder. The system "Chambon" does not allow large prints. It is very difficult to always have the same result, because the different colors are also mixed into the ink. The system "Giori" must give the same result for very large prints. At first I did not think so, but with these examples, it seems that this is possible with 3 colors. I am very surprised. 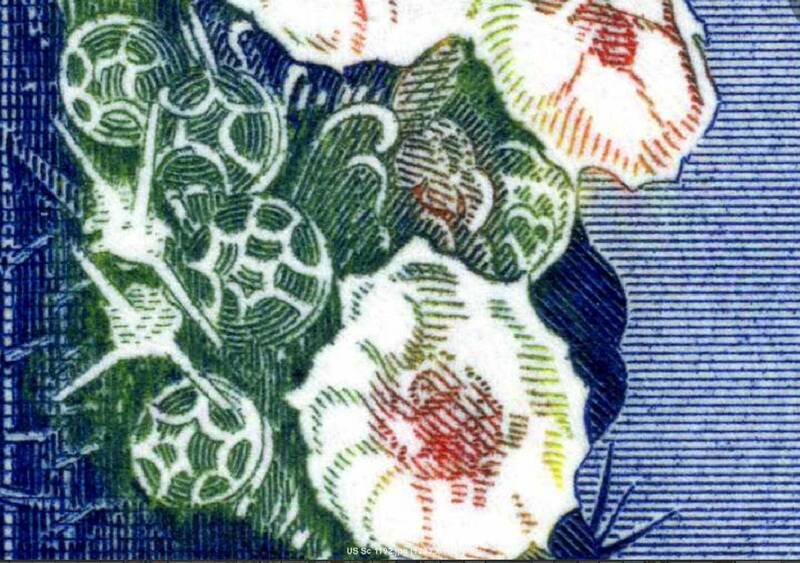 As always, your comments and observations on stamp production processes are most welcome and much valued. We badly needed someone of professional insight here. Special thanks for your kindness shown in your efforts to surmount the language barrier. How much simpler things would be if you could use your mother tongue here with so much ease as you do in your blog Impressions timbr�es. Still, as lithograving remarked on another thread, we basically understand each other, and I add, we are most grateful for your participation. Besides, whenever any doubts as to the meaning of words arise, things can always be cleared up. The I.T.V.F. 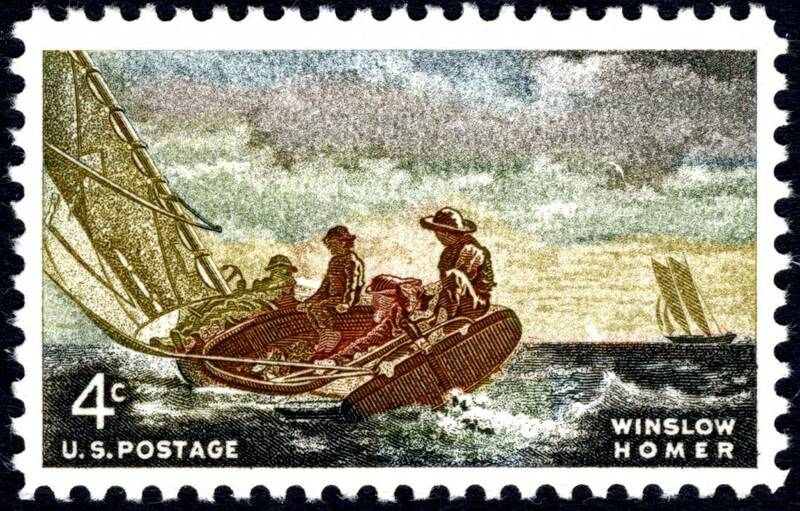 camaieu stamps are world-famous and widely admired for their facture by collectors on this forum. Pity the process has been abandoned in favour of cheaper and less laborious processes. It is interesting to note that four colours (deep blue, green, red & yellow) are mentioned with the 1962 Arizona Statehood issue while a variety of shades of brown & blue only were used for the 1962 Winslow Homer one. 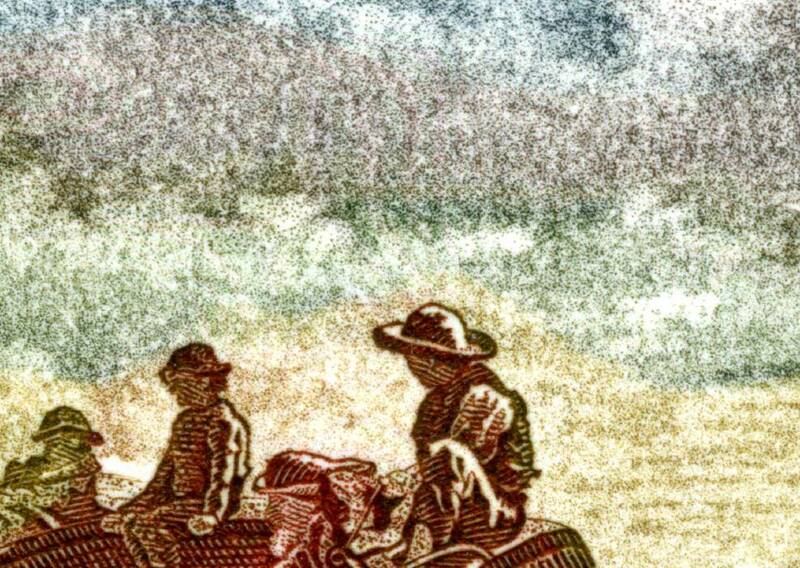 For the 1961 Frederic Remington issue, gradations of three colours (blue, red & yellow) are acknowledged as expected. The colours of the 1964 Nevada Statehood issue announced in the Postal Bulletin are the same as those reported in Arago: Philately. Thank you very much for the compliments. It's more complicated for me, but I have to make the effort to be in the rule. It is perhaps this "Giori" Press to print these stamps. As is shown that press has only three inkwell. The author of the information did not know, probably. Presses "Giori" can have 5 colors for printing banknotes. Perhaps the same presses for stamps. it was just the simple combination of blue/yellow producing the green ? then where does the yellow in the stamp come from? In my opinion, there are 3 colors, yellow, red and blue. We see that green is not smooth everywhere. There are differences. And the yellow comes from somewhere definitely. It is the superposition of the yellow and blue inks on the collecting cylinder, which gives green. In my opinion, there are 3 colors, yellow, red and blue. Papy24, that is exactly how I see it also. sources then you start to wonder. 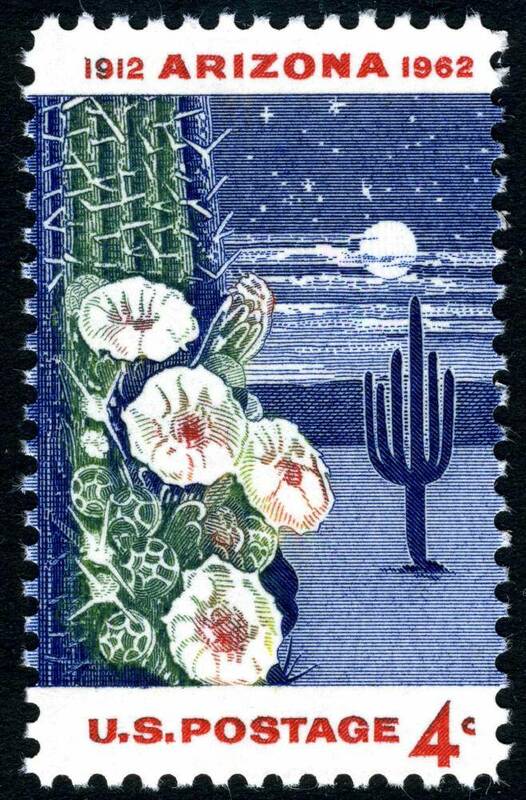 in the early sixties to produce these stamps. 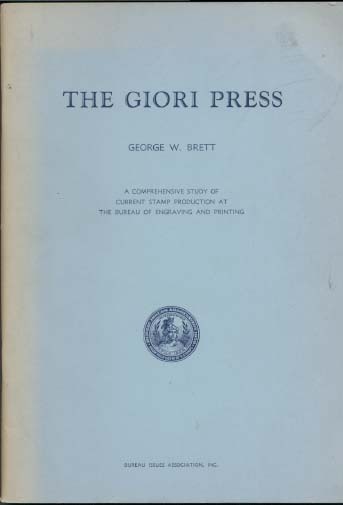 that he has the booklet THE GIORI PRESS, by George W. Brett. info regarding what we seek. puzzling is US Scott 1207 Winslow Homers's Breezing Up. as they usually did for other Giori printings at that time. appears in the clouds. Amazing printing. 50 years now and it is still one of my favourites. Papy24 - I absolutely agree with what you say in your post of Yesterday 12:38 pm. We definitely needed the expert eye of an experienced printer here. Thank you very much for your insights as well as the references you make in another of your posts, that of Yesterday 11:37 am. lithograving - I think the words "ink" and "colour" are used rather loosely in Arago: Philately, first describing the colour of the stamp in question, then the very same words for colour are being used again to describe inks in the "Medium:" description and these are sometimes different from those used in the Postal Bulletin ones. While, on the other hand, the Postal Bulletins often just mention the colours of the respective issue (these, of course, sometimes result from ink mixtures) ignoring the question of inks used. Not very authoritative either of the two sources, I am afraid. P.S. Posting from the regional public library I have to leave now and catch my train home. See you again on Monday.